Most of the pieces shown below are available with your choice of stone. For a list of stones that we usually have in stock please check the 'Ordering Info.' page. #B-015, one of our most popular pieces, is set with a fossil Ammonite approximately 350,000,000 years old. 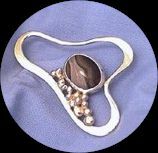 Some customers wear this piece as a pendant, a clip on bail can be attached through the open oval at the lower left through which a chain can be strung. #B-001, in this piece, the stone 'surfs' on an ocean wave with a spray of foam above. Generally set with a fossil Orthocera (350,000,000 years old), is available with alternate stones. #B-005, this brooch depicts a sunrise over the ocean and is usually set with Baltic amber. Shown here set with a Nova Scotian moss agate. I feel that any stone in the red to yellow range would work well in this piece. 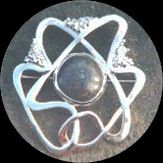 With a converter, this piece can also double as a pendant. # B-013, 'Treasure in the Bulrushes'. This piece is normally set with a fossil Orthocera, (see B-001), but shown here with a piece of dark, hand cut Malachite. 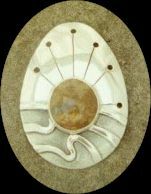 The distinctive Art Nouveau feel of this brooch makes it one of my personal favorites. # B-010, In 'Gift From the Sea', the stone rests on the ocean bottom surrounded by fronds of kelp swaying in the current. 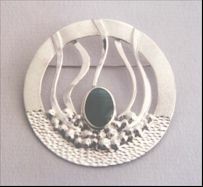 This hand textured brooch is probably our most popular piece and works equally well with any choice of stone. # B-019, Pat has named this piece 'Skin Drying, Spirit Rising' and is a tribute to traditional Native ways. Again, this piece works well with any choice of stone, and is shown here with a piece of black Dinosaur Bone. # B-020, an abstract geometric shape open to individual interpretation. Shown set with an unusual piece of banded Nova Scotian Agate. Personalize it with your choice and shape of stone. 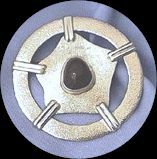 # B-021, Inspired by recent astral events, the 'Comet' brooch is particularly striking set with Baltic Amber but does work well with a variety of stones. 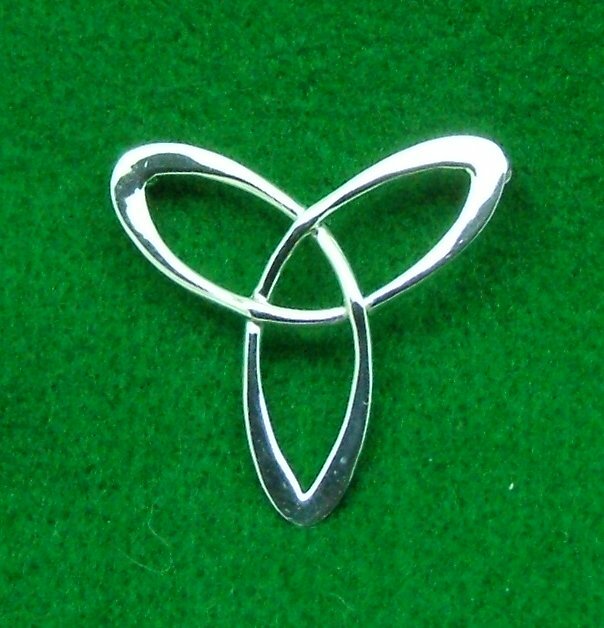 # B-016, A single wire, hand forged and intertwined gives this unique brooch a definite Celtic feel. 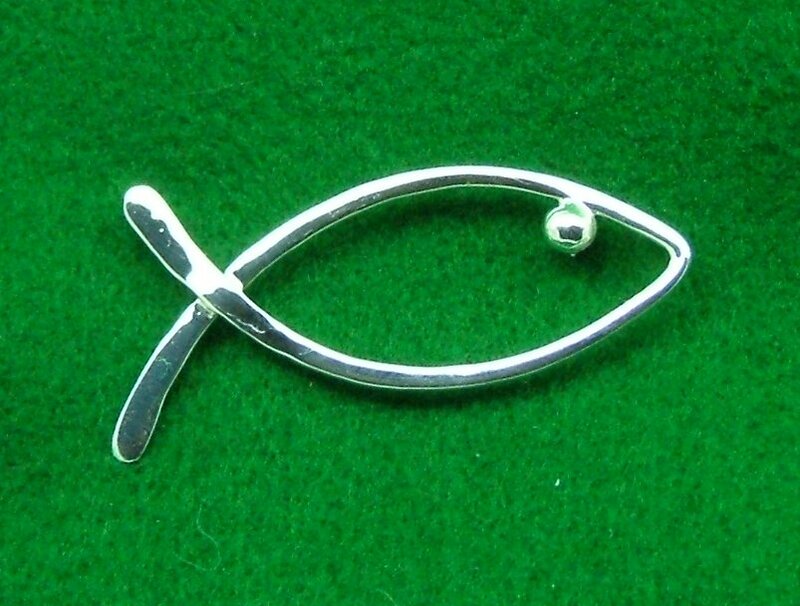 # B-52, A Minimalist Fish brooch in 12 ga. sterling wire.